When retrofitting high bay lighting fixtures for factories, warehouses, big box stores and gyms, switching from the legacy metal halides to fluorescent or LED fixtures can generate up to 50 percent in energy savings as well as providing instant-on and restrike features, improved color qualities and emergency ballasting options. After you’ve answered the fluorescent vs LED question, and you’re selecting which particular fluorescent lamps to use, most lighting contractors are looking to the T5 fluorescent and T8 fluorescent lamps as well as the T5HO (high-output) versions. T5 fluorescent lamps, sometimes called “skinny tubes,” are five-eighths of an inch in diameter, improving he photo-optic control of fixture light output and efficiency. In the world of high bay lighting design, as a general rule of thumb, a T5 fluorescent shop light fixture should be used in applications above 20 feet and T8 fluorescent lighting fixtures should be hung below 20 feet. There is a gap between 18 and 25-foot heights where either T8 or T5 fluorescent lighting fixtures can be used successfully. T8 fluorescent lighting fixtures perform best in areas with a controlled climate. It does do a better job than T5 in maintaining light output if it’s a colder environment, but is not recommended for environments below 55-60 degrees. The optimal high bay lighting solution depends on the industry’s working requirements. 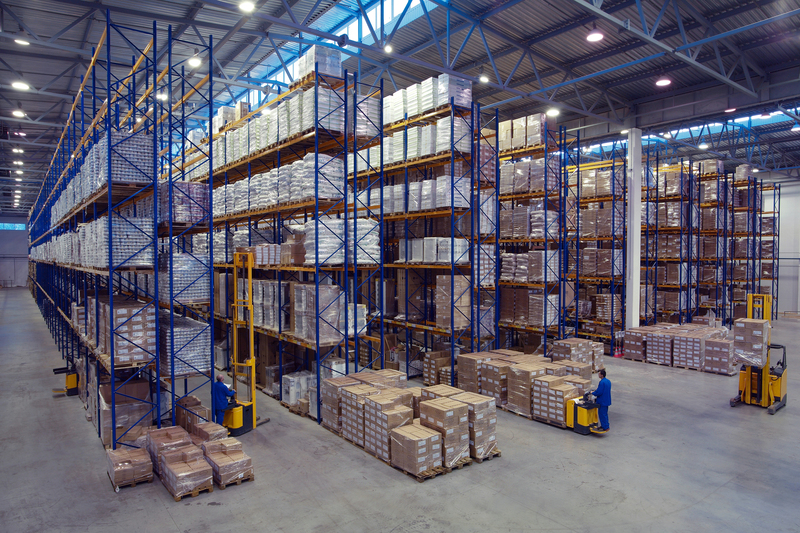 In some situations, lighting focused on a specific area is required to offer visual guidance to workers, whereas warehouses might require an optimal lighting solution throughout the space. For hot environments like textile or dyeing industries, high bay lighting needs to be efficient, sustainable and resistant enough to work under specific environments. High bay lighting is only effective when it is best suited for the environment in question and offers the right glare and vision quality. Another issue of concern is how many lamps within the fixture are required to achieve desired light levels? For example, generally, a 4-lamp T5 fluorescent lighting fixture will replace a standard 400-watt metal halide or high-pressure sodium fixture, while you would need 6 fluorescent T8 lamps in the proper lighting fixture to achieve the same results. The T8 fluorescent lamp, with its various ballast types, offers more options to finely tune the lighting levels. Adding to the equation is the emergence of high bay LED lighting, which offers the long-term economic benefits of a more advanced technology, although a high bay LED retrofit also require a heftier upfront investment. Nevertheless, warehouse LED lighting is on the rise, proving a cost benefit over time. Compared with traditional commercial and industrial lighting sources like incandescents, fluorescents and halogens, LEDs are more efficient, generate less heat, and give the same amount of light. Energy rated LEDs lighting lasts up to 50,000 hours. Fast-advancing technology and falling prices can mean real savings potential in commercial and industrial lighting—especially when LED lighting is matched to the right fixture for maximum efficiency. High bay LED lighting is ideal for warehouses and processing areas where dim-ability is a factor. Motion detectors pick up a forklift moving in an area and illuminate that area and dim the LED lights after the forklift has passed. Longer lamp life—Most LED lighting fixtures last up to 10 yearsFluorescent lighting requires new bulbs every one to two years. This allows plant owners to install high bay lighting in harder to reach places, such as over equipment, without worrying about interrupting production schedules. Low maintenance costs—Because of its longer lamp life, high bay LED lighting requires less maintenance than other high bay lighting types, allowing the plant to continue operations with fewer interruptions from service personnel. Ability to withstand cool conditions—LED lighting performs especially well in cooler conditions like freezer warehouses, unlike high bay fluorescent lighting, which is more sensitive to extreme low temperatures, causing malfunctions. “In general, I have been steering customers toward LED solutions. Looming obsolescence, energy efficiency, improvements in LED technology and reduced maintenance are among the reasons I like to recommend LEDs,” said one electrical contractor. “However, there have been considerations that have required me to rethink that approach. I have lost jobs or had them delayed because the upfront costs of an LED installation were so daunting. In the end, I still think LED lighting offers the best solution for all concerned, but the immediate need for a lighting solution at a more modest cost may override the advantages of LEDs,” he added. Fluorescent lighting, may still be most cost-effective solution and is considered best suited for employee areas and packaging sites. High bay fluorescent lighting is about 30 to 40 percent less expensive than high bay LED lighting and is the default choice for budget-conscious commercial and industrial facility owners. So when considering the fluorescent vs LED question, also remember that high bay fluorescent lighting is also be a good choice for areas of a commercial or industrial plant where product is less exposed, such as packaging. Some maintenance solutions for fluorescent lighting can create additional risks associated with bulb changes.